Wouldn’t it be nice if all of our political stereotypes were affirmed with every individual? You know, for progressives it would be easy if every Republican was gun-toting, uneducated, war-mongering, angry and generally uncouth. Without naming names, there are plenty of such types to go around. And before we go any further, progressives must keep in mind that others have their own stereotypes of us: tree-hugging, always politically correct, disrespecting authority, and even bed-wetting. Because I largely travel in the company of progressives, I know that the stereotype of liberals may be accurate about two per-cent of the time. I would argue that Republicans fit more into some semblance of the stereotypical cage that many progressives give them. And when progressive run into a Republican who does not fit the stereotypical image that we have of them, it can become challenging. But do not totally fear, progressives are much better at tolerating ambiguity than conservatives. Wisconsin congressman and Speaker of the House Paul Ryan certainly presents challenges for progressives. He is somewhat of the anti-Trump, which appeals to many, but in reality he is but one among many Republicans who fit that moniker. It’s more than that. He seems like the kind of guy who you would trust to take your kid with his family on an “American vacation.” He’s most likely polite to people who wait on him. In his personal life he probably has equal respect for men and women and does not bear ill-feelings towards those whose sexual orientation is different from his own. But dammit, those ideas of his can be unnerving. A dogmatic conservative, Mr. Ryan has often used the budget process to score ideological points. He puts too much faith in supply-side reform as a growth-boosting counterweight to austerity. He launched a hapless effort to defund the health-care reform that is President Barack Obama’s main domestic achievement. He has supported generous tax cuts for the wealthy and railed against expenditures to maintain a social safety net, even for children and the elderly. How could a nice guy have such seemingly nasty positions on the issues? We could learn a thing or two from Reagan biographer Peggy Noonan who told the story that if Reagan was taking a stroll outside the White House and a beggar came up and asked him for a dime, the President without hesitation would reach into his pocket and give him one. But if the same beggar was to be the beneficiary of an economic program that would help him, it’s likely that Reagan would have opposed that program and left the beggar starving. 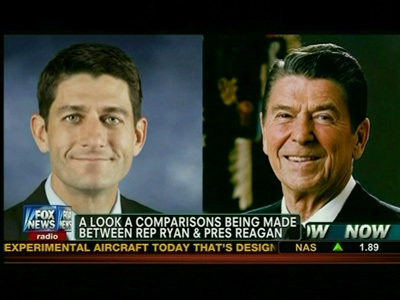 It is indeed somewhat of a conundrum for progressives when we encounter a Ronald Reagan or a Paul Ryan. How they can personally be so nice while supporting public policies that are Republican-mean is difficult to understand. This is why it is helpful to study the Republican Brain to gain more insight. In the meantime, it makes sense to be cordial with the likes of Reagan and Ryan, but also to beware.